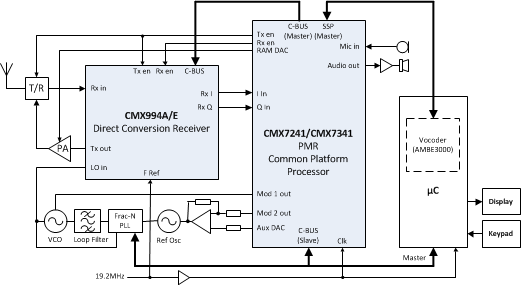 The CMX7241/CMX7341 provides a common platform that can deliver digital FDMA, 2-slot TDMA and legacy analogue PMR/LMR with direct connection to an I/Q based RF receiver. The chip-set comprising CMX7341 PMR/LMR Common Platform Processor + CMX994A Direct Conversion Receiver (DCRx) enables a high integration and cost-effective radio platform to be realised. Currently DMR, dPMR™ and legacy Analogue PMR/LMR are supported.